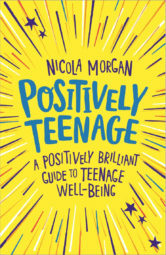 I’m excited to launch a new well-being competition for schools: ASK NICOLA MORGAN. It is educational, fun, simple to enter and has great prizes! This is to celebrate the May 24th launch of both POSITIVELY TEENAGE (Hachette Children’s Group) and THE TEENAGE GUIDE TO LIFE ONLINE (Walker Books). Thank you to both publishers for their help setting this up, their full support behind it and their generous prizes. Also thank you to the publicists at both for working so wonderfully together. We make a pretty fab team and a great example of publishers and authors working in partnership, something I often bang on about. This competition is all about asking questions. Asking questions is a sign of intelligence. It is the first step to knowledge and understanding. Thinking carefully about questions, so you get information you want, is a very useful skill. So, my competition encourages schools to ask good questions – AND get the answers. Every school that enters (and follows the Terms and Conditions) will have at least one question answered on my website and the school will be name-checked when I publish your answer. If you wish, student and teacher names can also be published, in the exact format you request. Eg First names and ages, “Mrs Dot’s class”, “Teenage Kicks Book Club” or whatever. Each school can only enter once but each entry allows THREE questions. THREE schools will also win a fantastic prize of books and other items. 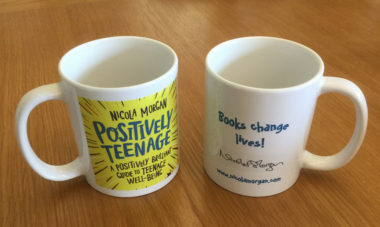 A Positively Teenage mug for the school librarian – ideally to keep in the school library or staff-room so that lots of people can admire it! PLUS, the overall winner will also have the opportunity for a Skype “visit” from me, involving 30 minutes of chat and Q&A. Depending on the location of the winning school(s), I might be able to come in and meet the winning class or group for an informal Q&A and chat. I can only offer this if I am going to be in your area or could easily and cheaply reach you. WHAT SORT OF QUESTIONS AM I LOOKING FOR? 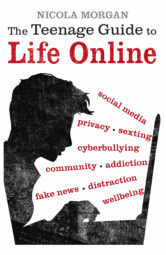 Questions should be at least a bit relevant to either (or both) Positively Teenage or The Teenage Guide to Life Online. You haven’t read the books, of course*, and I obviously don’t expect you to know in detail what they cover, but you need to be thinking about anything to do with teenage wellbeing or development or anything to do with use of screens, phones and online activities. If you want to ask something about my fiction, you could try to link it to one of those well-being or life online topics. You might try to think of a question I have not been asked before – that would be great but I also think basic questions are important, so feel free to ask something simple if you want to. Perhaps you might think of a mix of unusual and ordinary questions? I think a mixture of questions is a good idea. I don’t mind whether questions are easy or difficult – there’s equal value in both. Avoid questions like, “What parts of the brain do we use for…?” or “Who invented the Internet?” Those are purely factual questions which you can easily find the answer to yourself. I want you to find out what I think, what I’ve learnt, what my advice is, what I think is important. My website is for all ages, so please avoid questions that are likely to offend some readers. I reserve the right to ignore any questions that I feel uncomfortable about answering in public. Read the full COMPETITION TERMS & CONDITIONS here. Entries that don’t follow those rules will be ignored! Get students to think about questions and decide the school/year/class’s choice of THREE questions. All entries must be submitted by an adult on behalf of a school. The adult must be employed by or have the authority of the school to enter the competition. UK or Irish schools only. Deadline 5pm June 8 2018. Parents and teenagers, get your schools to enter! Tell your school librarian, year tutor, or PHSE teacher! An educational, simple, fun competition with prizes – what’s not to like?! And, with the promise to name check and answer a question from every school entering, everyone’s a winner!